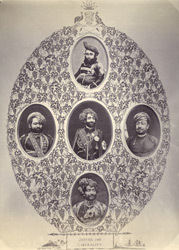 Photographs of various Nawabs of Junagadh and state officials, taken by the travelling commercial photographer F. Nelson during the 1890s. The album is inscribed: “With best compliments from H.H. Rasulkhanji, Nawab of Junagadh (India)” and was formerly in the collection of Sir William Lee-Warner (1846-1912), who served in the Indian Civil Service and was a Member of the Council of India between 1902 and 1912. The Princely State of Junagadh was founded in 1735 by Muhammed Sher Khan Babi (r.1748-1758). He was the first of a line of Nawabs from the Muslim Babi dynasty who ruled Junagadh from the 18th to the 20th century. The five portrait vignettes are mounted in a floral oval and crowned with a coat of arms, which reads: “Advance Australia”. Below this is the word, “Saurashtra”, the name of the peninsula which forms the bulk of Gujarat. The portraits are as follows: (top) Mahabat Khan (r.1851-1882), (centre) Bahadur Khan (r.1882-1892), (bottom) Rasul Khan (r.1892-1911), (left) unidentified, (right) Baha-ud-din, a Vazir of Junagadh.